Notes: Ashton-in-Makerfield station was situated on the St Helens Central to Lowton St Mary’s branch which left the Glazebrook to Wigan Central line at Lowton St Marys. This line had been sanctioned as early as July 1885 and the original intention was to create a line that would link Wigan to Southport by creating a route from Lowton St Marys to Fazakerley Junction on the Cheshire Lines Committee (CLC) North Liverpool Extension Line. The railway company that was formed to build the line was called the St Helens and Wigan Junction Railway (SH&WJR). The SH&JWR became the Liverpool St Helens and South Lancashire Railway (LSH&SLR) on 26 July 1889 but they were in constant financial difficulty and despite the first sod being cut on 28 January 1888 the line did not open to goods traffic until 1 July 1895 and even then only from Lowton to St Helens. It was to take another five years for the line to be brought up to passenger standards by which time any hope of continuing west had been abandoned. Ashton-in-Makerfield station opened on the 3rd of February 1900. The station was built to serve the township of Ashton-in-Makerfield which lay to the north but it was actually within the boundary of Haydock. The station was on the west side of Lodge Lane, the A49, which passed over the line on a bridge. A single storey brick built building located on the south side of the line provided the main entrance and booking office. The route of the line through the station was double track so the station was provided with two platforms both of which were provided with brick built waiting facilities. The station was also provided with a goods yard which was located behind the westbound platform and ran up to the rear of the main station building. The yard had a goods shed and three sidings. Unusually the goods sidings were at a higher elevation than the passenger platforms. Passenger services were provided by the Great Central Railway (GCR) which had invested money in the line. There were six trains in each direction from Ashton-in-Makerfield. In the westbound direction all of the trains went to St Helens Central. Five of the eastbound services ran through to Manchester Central and one terminated at Lowton St Mary. 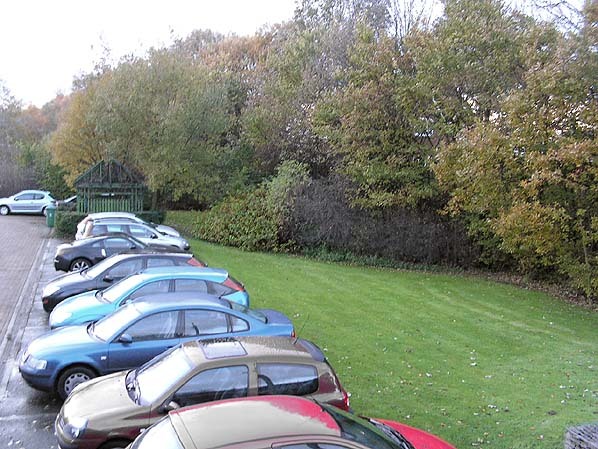 Ashton-in-Makerfield station was situated close to the Haydock Park Racecourse and from the start it handled race day excursions even though a station was opened to the east inside the grounds of the course. On 1 January 1906 Ashton-in-Makerfield station became part of the GCR when the LSH&SLR was absorbed by them. The station master at this time was William Walsh who had accommodation in Beech Villa which was adjacent to the station. Walsh had previously been station master at Culcheth. In the last year of the GCR there were five eastbound and six westbound trains on weekdays as shown in the table below and none on Sundays. At the ‘Grouping’ of 1923 the line became part of the London & North Eastern Railway (LNER). The LNER ran additional services between ManchesterCentral and St Helens Central. On the 1 January 1948 Ashton-in-Makerfield station became part of the nationalised British Railway’s Eastern Region but within a few months it was transfered to the London Midland Region. In the fist year of nationalisation Ashton-in-Makerfield had only four eastbound and four westbound services Monday to Friday. On Saturdays there were only three westbound trains. Although the line had proved to be remunerative in terms of goods, as it passed through an area of numerous collieries, it never lived up to expectations with regards to passenger services. As a result British Railways withdrew the passenger service from the line on the 1 March 1952 and Ashton in Makerfield station was closed to passenger services. The station continued to handle race day excursions throughout the 1950s. On the 4 January 1965 the line from St Helens Central to Ashton in Makerfield closed completely and it was lifted to a point several hundred metres to the west of the station. 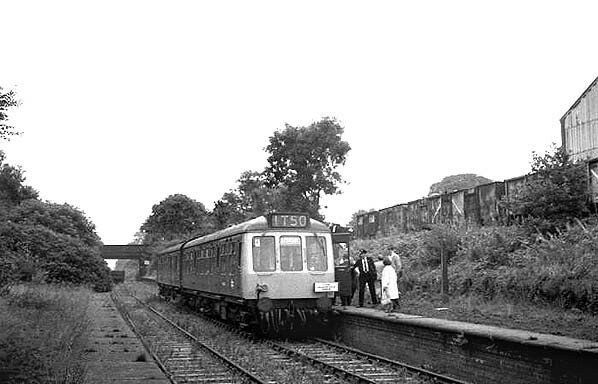 On 24 August 1968 a Diesel Multiple Unit brought passengers to Ashton in Makerfield station on a Railtour called the ‘Makerfield Miner'. During the same year a connection was put in to the West Coast Main Line over which the St Helens and Lowton line passed at Golbourne. The connection allowed the route through to Lowton St Mary and down to Glazebrook to close. In June 1969 an oil terminal opened a short distance to the west of Ashton-in-Makerfield station which was seved by block oil trains. A scrap business established itself on the goods yard site and made use of its rail connection. The yard even had its own shunting locomotove. In 1975 the last racecourse excursions visited Ashton-in-Makerfield. The last oil trains ran in 1983 and the scrap metal company last used rail in 1989. Excepte for a short section near to the West Coast Main Line the surviving section of the former St Helens and Lowton St Mary branch closed in1991 and was lifted shortly after. The station platforms remained extant until the whole site was redeveloped as office accommodation in the early part of the 21st Century. The Cheshire Lines Committee, by P Bolger, 1984, Heyday Publishing Company. BR (LMR) Timetable summer 1948. 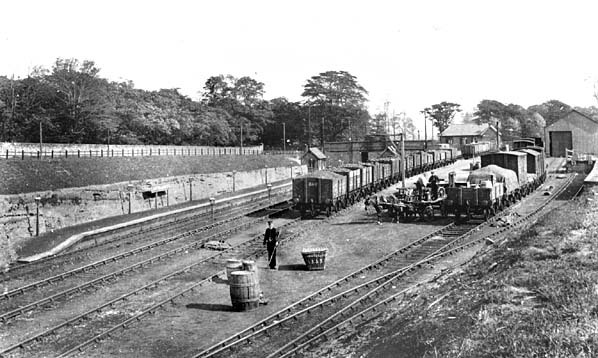 Ashton-in-Makerfield station looking east in 1910. The goods facilities are clearly shown. Ashton-in-Makerfield station shown on a 1905 map. 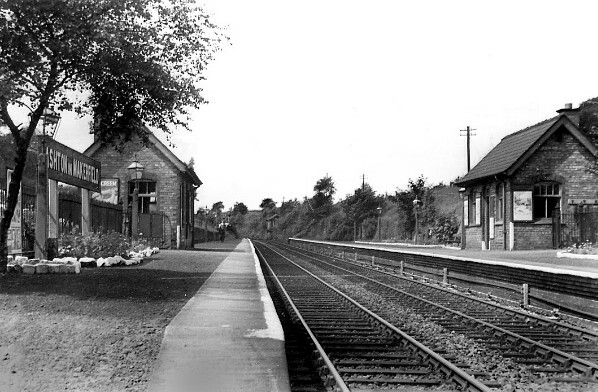 Ashton-in-Makerfield station as it was in 1961. Although it had closed to passengers in 1952 it was still open for goods services. The station staff of Ashton in Makerfield seen in the early years of the 20th century resplendent in their GCR uniforms. 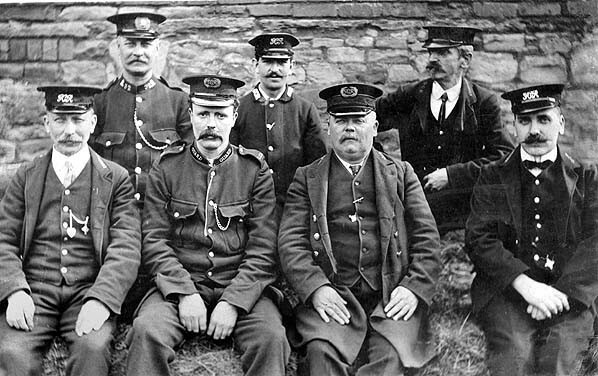 Second from right on the first row is William Walsh who was station master. Ashton-in-Makerfield Station looking west along the St Helens direction platform in 1950. The 'Makerfield Miner' rail tour stands at the former St Helens direction platform at Ashton in Makerfield station in August 1968. Ashton in Makerfield station looking west on 28 August 1976. The station had been closed for twenty-four years by this date but it was still clearly recognisable as a former passenger station. During the 1970s and through to the late 1980s freight services to a scrap yard and to an oil terminal continued to pass through the station. 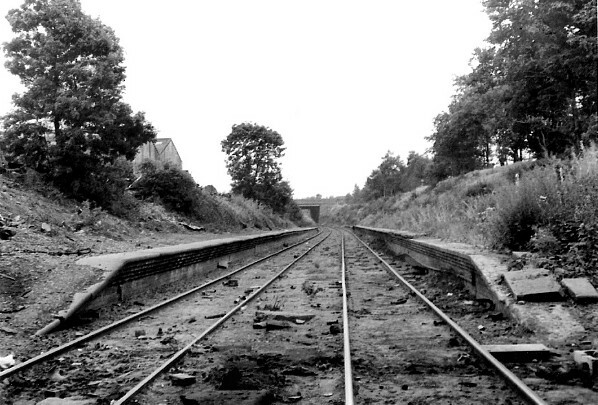 Ashton-in-Makerfield station looking east on 16 September 1979. 16 September 1979. Only four years earlier race day specials had run to the station. 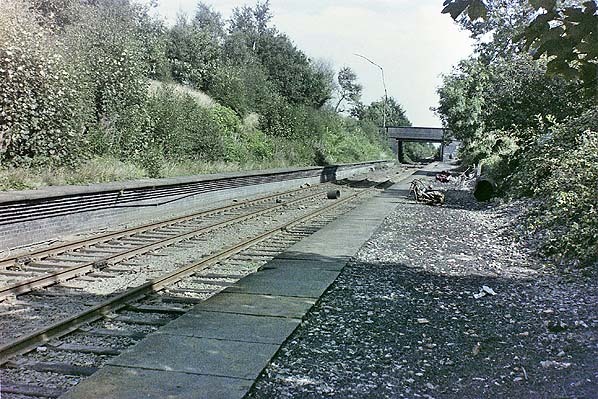 Ashton-in-Makerfield station looking west on 16 September 1979. 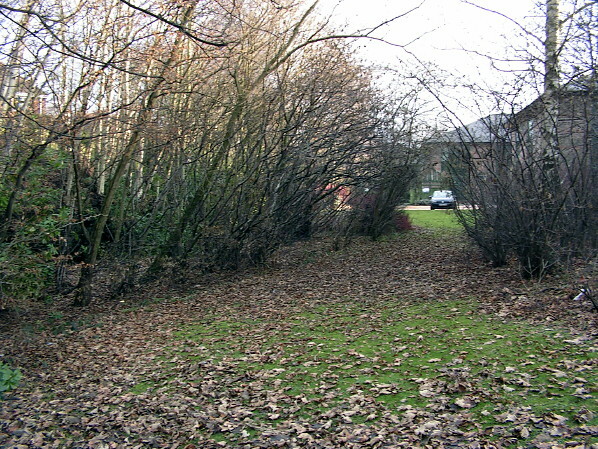 A view looking east at the site of Ashton in Makerfield station in January 2011.